Adding a feather in the cap, Railway Ministry Suresh Prabhu launches 'Clean My Coach' Service to ensure cleanliness in trains. As per the scheme, for any cleaning requirement in the coach, the passengers will have three different ways to call an attendant to clean their coach. The easiest one is using SMS service. 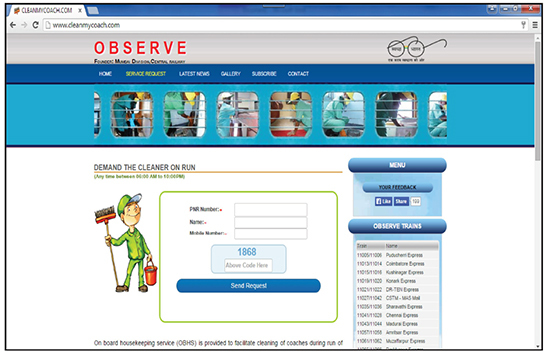 To send an SMS "CLEAN <Space> PNR and send it to 58888. The Ministry said, passenger’s request is immediately acknowledged via SMS on mobile phone along with a code. A message is also sent by the server to the mobile number of on board house keeping staff travelling on the same train along with the details of the passengers such as coach number, berth number. The house keeping staff contacts the passengers, carries out the cleaning work as per demand. Passenger can also use android app 'Cleanmycoach Indian Railways’. It is an official app easy-to-operate. The passengers just have to enter their PIN number and Mobile number to request a cleaning staff. Another option is by webpage ‘cleanmycoach.com’ for logging the request. Railway ministry under Suresh prabhu has already been extolled on many occasions of using social media platform under digital India mission, of connecting, receiving and responding to the complaints of the passengers. In the direction to improve the basic services of railway and passenger's journey experience, this initiative taken to enhance the basic cleanliness of the trains under 'Swachh Rail, Swachh Bharat' mission. With the help of digital connectivity, it will convenience for the passengers to avail this service and help in keeping the trains clean during their journey. Comments "How to avail 'Clean my coach' service started by Indian Railway"